The 9th edition of the renowned Osler’s Textbook on the Principles and Practice of Medicine, published in 1921, dedicated only two (out of 1,139) pages to lung cancer, at which point the condition was described as “New Growths in the Lungs”. Almost a hundred years on, the patterns of epidemiology have shifted drastically, and lung cancer now is recognised as a major health problem globally with more than 1.8 million new cases diagnosed every year. It is the second most common cancer diagnosed in the UK for both men and women, with approximately 46,400 new cases in 2014. Unfortunately more than 60% of cases are diagnosed at Stage III and IV (Figure 1 (see below)), meaning the tumour has spread outside the lungs and into lymph nodes or other organs. The prognosis of patients in these later stages is considerably worse than those diagnosed with Stage I or II disease where the tumour is confined in the lungs and is usually smaller. Stage III and IV disease also tend to develop significant symptoms preventing them from receiving aggressive treatments. It is estimated that more than 80% of patients with Stage I lung cancer will survive beyond 1 year, whilst less than 20% of those with Stage IV disease are expected to do so (Figure 2). This signifies the importance of early diagnosis, as it necessarily translates into treatment options with a curative intent. A definitive diagnosis of lung cancer is usually made on tumour biopsies. 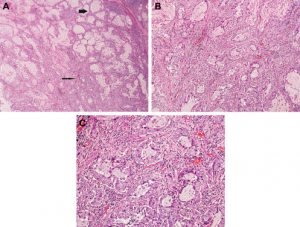 Biopsies are small but representative portions of tissue from the tumour, obtained mainly via bronchoscopy (Figure 3)  and image- guided skin puncture (Figure 4) . The tissue will then be processed and stained in the laboratory, before assessment under the microscope by a histopathologist. The minute features of the individual cells and overall architecture differentiate between cancer and normal tissue (Figure 5). 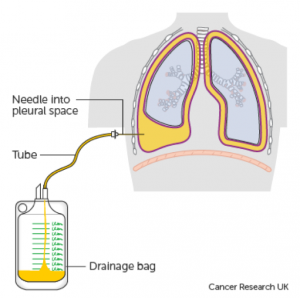 If patients develop fluid around the lungs (also known as pleural effusion), a drain can be inserted (Figure 6) and we can look for cancer cells floating in the fluid (Figure 7). Like all cancer types, the test results are discussed regularly at multidisciplinary meetings with doctors, surgeons and nurses where treatment plans are decided. 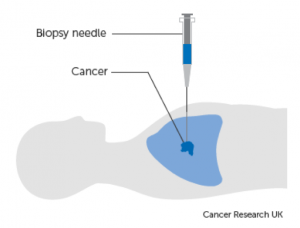 Assessment of biopsies by a pathologist is a core component of the recently commissioned National Optimal Lung Cancer Pathway (NOLCP), which aims at improving early diagnosis of lung cancer in the UK. Recent advances in lung cancer genetics have transformed our practice. The adoption of standard testing of biopsies with special stains for particular genes allows more refined diagnosis of lung cancer subtypes. Sequencing of relevant genes such as Epidermal Growth Factor Receptor (EGFR) reveal patients whose tumours are sensitive to targeted therapies. By assessing the expression levels of Programmed Death Receptor 1 Ligand (PD-L1), we are able predict a group of patients who will respond better to immunotherapies (Figure 8) , some of whom will receive long lasting disease control. However, with such advances being undertaken at an unprecedented rate, many questions arise in the field of pathology. We are inevitably facing the scenario of “Doing More with Less”, i.e. there is a need to increase information yield with limited amount of clinical materials, which is often the case in initial diagnosis. Essential questions to be answered include: How do we ensure we have got sufficient clinical material for the ever-increasing number of ancillary tests? Can we provide the information in a timely fashion? How are we going to interpret and integrate the test results with clinical information? What is the relationship between genetic test results and what we see under the pathologists’ microscopes? And perhaps more relevant to the theme: Is there a novel biomarker, test or modality that can lead to even more patients to be diagnosed earlier? Hopefully these questions will be answered soon by translational research extensively supported by patient- derived tumour tissues. These tissue samples are either left over from biopsies taken for diagnosis, or are donated by the patients. For example, a major component of The 100,000 Genomes Project , funded by the Department of Health (DoH), is sequencing various cancer types on a massive scale, including many cases of lung cancer. The TRACERx study  looks at the genetic aspect of various parts of the same lung tumour, showing how cancer develops and changes over time. Gone are the days when advances in the diagnosis and treatment of diseases were made primarily through observations by individuals. The research endeavours of the scientific community show strongly that there is now a greater need for multidisciplinary effort, active patient engagement, and international collaboration. Lung Cancer Statistics. Cancer Research UK. http://www.cancerresearchuk.org/health-professional/cancer-statistics/statistics-by-cancer-type/lung-cancer. Accessed 14/11/2017. Bronchoscopy under local anaesthetic. Cancer Research UK. 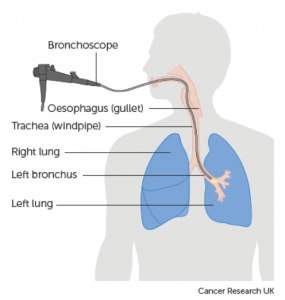 http://www.cancerresearchuk.org/about-cancer/lung-cancer/getting-diagnosed/tests-diagnose/bronchoscopy-local-anaesthetic. Accessed 14/11/2017. Biopsy through the skin. Cancer Research UK. http://www.cancerresearchuk.org/about-cancer/lung-cancer/getting-diagnosed/tests-diagnose/biopsy-through-skin. Accessed 14/11/2017. Travis WD, Asamura H, Bankier AA, Beasley MB, Detterbeck F, Flieder DB, Goo JM, MacMahon H, Naidich D, Nicholson AG, Powell CA, Prokop M, Rami-Porta R, Rusch V, van Schil P, Yatabe Y; International Association for the Study of Lung Cancer Staging and Prognostic Factors Committee and Advisory Board Members. The IASLC Lung Cancer Staging Project: Proposals for Coding T Categories for Subsolid Nodules and Assessment of Tumor Size in Part-Solid Tumors in the Forthcoming Eighth Edition of the TNM Classification of Lung Cancer. J Thorac Oncol. 2016 Aug;11(8):1204-1223. doi: 10.1016/j.jtho.2016.03.025. Treatment for fluid on the lung (pleural effusion). Cancer Research UK. http://www.cancerresearchuk.org/about-cancer/coping/physically/breathing-problems/treatment/fluid-on-the-lung-treatment. Accessed 14/11/2017. Travis WD, Rekhtman N. Pathological diagnosis and classification of lung cancer in small biopsies and cytology: strategic management of tissue for molecular testing. Semin Respir Crit Care Med. 2011 Feb;32(1):22-31. doi: 10.1055/s-0031-1272866. Kerr KM, Tsao MS, Nicholson AG, Yatabe Y, Wistuba II, Hirsch FR; IASLC Pathology Committee. Programmed Death-Ligand 1 Immunohistochemistry in Lung Cancer: In what state is this art? J Thorac Oncol. 2015 Jul;10(7):985-9. doi: 10.1097/JTO.0000000000000526. The 100,000 Genomes Project. Genomics England. https://www.genomicsengland.co.uk/the-100000-genomes-project. Accessed 14/11/2017. Jamal-Hanjani M, Wilson GA, McGranahan N, Birkbak NJ, Watkins TBK, Veeriah S, Shafi S, Johnson DH, Mitter R, Rosenthal R, Salm M, Horswell S, Escudero M, Matthews N, Rowan A, Chambers T, Moore DA, Turajlic S, Xu H, Lee SM, Forster MD, Ahmad T, Hiley CT, Abbosh C, Falzon M, Borg E, Marafioti T, Lawrence D, Hayward M, Kolvekar S, Panagiotopoulos N, Janes SM, Thakrar R, Ahmed A, Blackhall F, Summers Y, Shah R, Joseph L, Quinn AM, Crosbie PA, Naidu B, Middleton G, Langman G, Trotter S, Nicolson M, Remmen H, Kerr K, Chetty M, Gomersall L, Fennell DA, Nakas A, Rathinam S, Anand G, Khan S, Russell P, Ezhil V, Ismail B, Irvin-Sellers M, Prakash V, Lester JF, Kornaszewska M, Attanoos R, Adams H, Davies H, Dentro S, Taniere P, O’Sullivan B, Lowe HL, Hartley JA, Iles N, Bell H, Ngai Y, Shaw JA, Herrero J, Szallasi Z, Schwarz RF, Stewart A, Quezada SA, Le Quesne J, Van Loo P, Dive C, Hackshaw A, Swanton C; TRACERx Consortium. Tracking the Evolution of Non-Small-Cell Lung Cancer. N Engl J Med. 2017 Jun 1;376(22):2109-2121. doi: 10.1056/NEJMoa1616288. A. Low power; B. Medium power; C. High power. Figure adopted from Travis et al. .
A. Singly dispersed tumour cells; B. Tumour cells forming clusters. Figure adopted from Travis and Rekhtman . 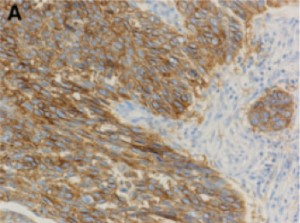 Strong staining (Brown) correlates with high level of PD-L1 expression in tumour cells. This predicts sensitivity towards PD-L1 based immunotherapy. Figure adopted from Kerr et al. .